Combining parts of a Big Brother “1984” plot with a raft of pop culture references, the animated 3D film succeeds through great comic writing that is never lazy or expected. There are a million jokes you can make about Batman, Superman, Wonder Woman, Abraham Lincoln, “Star Wars” and so on, but all the jokes made in “The LEGO Movie” are sharp and impeccably timed. This is a film in which the laughs just keep coming, floating like waves on the Lego sea (yes, water is made of Legos, everything is made of Legos). To get happy for 100 minutes, put this film in the entertainment line-up. The Lego society is specifically structured. Each individual citizen is designed for their job, and they happily go about them – while buying expensive coffee and singing the big hit, “Everything is Awesome.” Emmet (voice of Chris Pratt) is one of those citizens, so bland that his co-workers can’t quite place him. Everything changes when Emmet discovers a infiltrator named WildStyle (Elizabeth Banks), who thinks Emmet is the “MasterBuilder,” a savior foretold by prophecy. 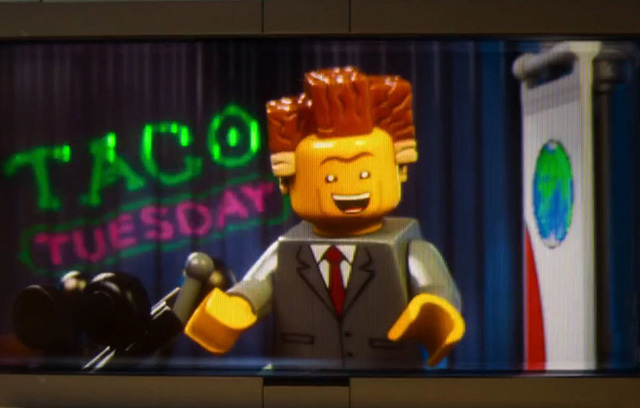 There is a plan to actually destroy society for control, perpetrated by President Business (Will Ferrell), and Emmet becomes the unlikely Legotian to stop the plan. With the help of Batman (Will Arnett), a pirate named Metal Beard (Nick Offerman), a Unicorn Kitty named Unikitty (Alison Brie), 1980s Astronaut Benny (Charlie Day) and a guru name Vitruvius (Morgan Freeman), they might be able to save this interlocking universe. Let’s start with the art design of the 3D animation, which is funny in itself. Everything, even elements like fire and water, are made of Legos. Most impressive is the Lego sea, which a pirate ship jokingly skates upon. Once the movie hits the DVD shelves, freeze frames will be a stitch. The characters are also quite funny. They are the bland-faced Lego characters that have spanned two generations of kids, and many jokes are made about their expressions, led by the Liam Neeson-voiced good cop/bad cop. The script, manufactured and strung together by co-directors Christopher Miller and Phil Lord (“Cloudy with a Chance of Meatballs”) is a amazing pastiche of gags, great pop culture jokes and visual hilarity. The duo especially have fun with the persona of Batman, and Arnett gives him a perfect voice. The advantage of writing the script and directing the animation is in full bloom here. The cast is having a good time as well. Banks is a perfect exasperated action heroine, who takes grief for her preferred nickname of WildStyle (“are you a D.J.?”). There are a ton of familiar voice cameos, some doing their original characters (Billy Dee Williams as Lando Calrissian), and even Freeman is goofier as Vitruvius and makes fun of his voiceover seriousness. There is a live-action sequence, and it does jar the proceedings a bit – but it is there to make a point about the lesson-to-be-learned, and to parallel the Lego world within a child’s imagination. It’s possible they didn’t even need the lesson or the parallel world, but in the sense of what the real and imagined was trying to express, so be it. It adds a few laughs, and has a bit of heart. What else do you want for your extra 3D movie fee? When is the last time you really laughed hard at a film? 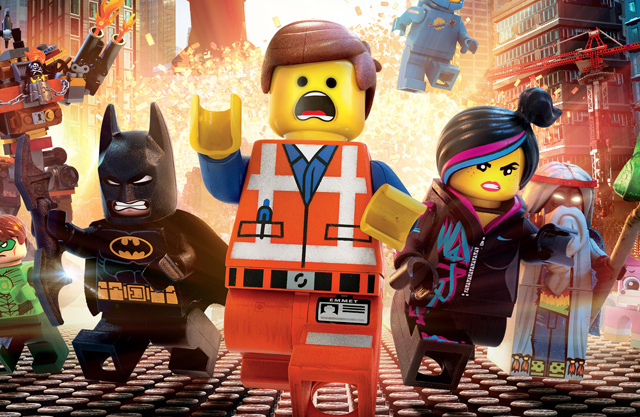 “The LEGO Movie” is guaranteed to provide that fun, and believe in this – it doesn’t happen that often in modern cinema. What a lofty term to use (“modern cinema”) for so much joy. Submitted by Mr. Leland on February 8, 2014 - 12:24pm. Your review makes it sound so enticing. Maybe I’ll go after all. Wonder what legal hurdles they had to get Batman, etc. A little known caveat in their licensing agreement?